Our videoconferencing application, VSee, can support up to 3 camera feeds on a computer: a main camera, and 2 auxiliary cameras. 1. Connect the additional camera to your computer using a USB. 2. While in session, hover your mouse over your own video window (i.e., your own image) and click on the gear icon that appears in the lower right-hand corner. From the drop-down, select "Add Another Camera" and then select the camera that you've connected to your computer. A new video window should appear with feed from the new device. 1. While in session, hover your mouse over the video window of the camera you would like to remove and click on the gear icon that appears in the lower right-hand corner. 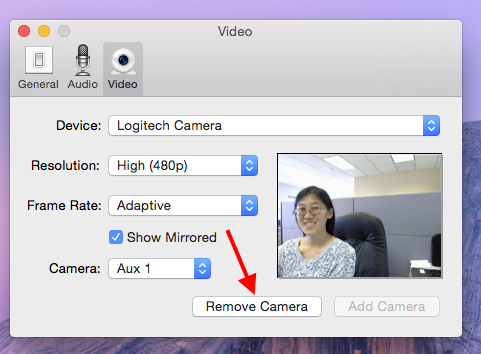 From the drop-down, select "Remove Camera" and the video window will disappear. Note: you cannot remove your main camera. You will need to change your main camera to use a different device first. 2. While in session, click on "VSee" in the upper left-hand corner. (If you don't see this menu there, click on your own video window, and the menu should appear.) Select "Preferences" from the drop-down menu for a second window to appear. 3. Click on the "Video" to get to your camera settings. 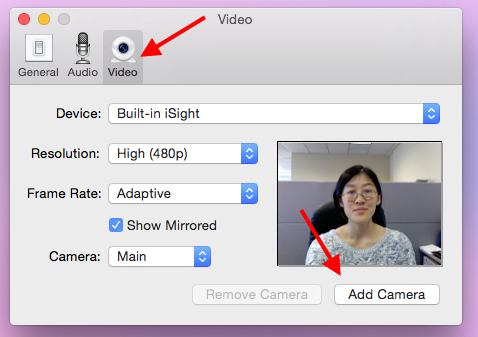 In the lower left-hand corner, click on "Add Camera" to automatically add your USB camera. 1. While in session, click on "VSee" in the upper left-hand corner. (If you don't see this menu there, click on your own video window, and the menu should appear.) Select "Preferences" from the drop-down menu for a second window to appear. 2. Click on the "Video" tab to get to your camera settings. Along the bottom of the message, click "Remove Camera" to remove the selected camera. 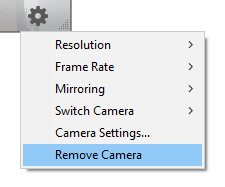 If you wanted to remove a different camera, select that device from "Camera". This article was last reviewed by our Support team on December 31, 2015.